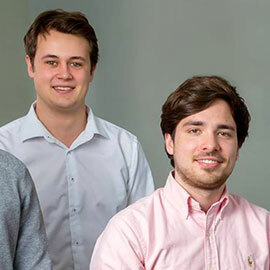 Henry Goddard and George Lifchits, both in their final year at Laurier, work in front-end development for a legal startup called Beagle. The Kitchener company’s software makes the process of reviewing legal contracts faster and more efficient. “The company is a brainchild of our CEO and founder, Cian O'Sullivan,” said Goddard, a BBA/Computing and Computer Electronics student at Laurier. Goddard was introduced to O’Sullivan in his co-op term at D2L. In the winter of 2014, O’Sullivan approached Goddard to help him with the development of a new legal startup. Goddard then contacted Lifchits, a Laurier BBA/Computer Science student whom he had been working with on a group project for a finance course at Laurier. “I reached out to George for some help and we've not looked back since,” said Goddard. Beagle seeks to alter a large part of the legal profession: the reviewing of lengthy legal contracts. O’Sullivan’s team developed software that reviews a proposed contract at the speed of one page per second, and highlights clauses in four critical areas: responsibilities, liabilities, terminations and external references. Their solution saves hours of poring over pages of legal documents. When O’Sullivan first approached him, Lifchits decided to help with development on a part-time basis so that he could continue his schooling at Laurier. During this time, he and Goddard were working to build a prototype of the product and socializing the idea with customers and investors. “When we were accepted into the Microsoft Ventures accelerator (MSVA) in Seattle, I decided to take a semester off to work on Beagle full time,” said Lifchits. Beagle is the only Canadian startup to make it into the four-month accelerator program run by Microsoft. About 600 startups from around the world applied, and only 14 were accepted. In addition to his front-end development role, Lifchits is also responsible for other development requirements as needed, and for representing Beagle in a business context at conferences and events. Goddard, like Lifchits, is involved predominantly in front-end development, but has also worked on a number of pitches at Microsoft, and on support for the software. “Our roles are quite fluid,” said Lifchits. Both Lifchits and Goddard have attributed their success with Beagle to their positive experiences at Laurier. For Goddard, Laurier’s co-op program played the largest role in his success with Beagle. “Had it not been for the industry-applicable skills fostered from it, or more importantly the business relationships it established early in my career, this would not be a reality,” he said. The company is made up of seven members: O’Sullivan (CEO and founder), Goddard and Lifchits (front-end development), Bogdan Ivanov and Iulius Curt (back-end development and machine learning), Costin Chiru (artificial intelligence research) and Samantha Hunter (business and sales).